Quite a bit has changed during the production of Another Star , even since the first beta was recently released. Can you spot what’s new in the following screenshot? If you played the beta or “leaked” version of the game at all, you should realize that there’s a new in-battle command that wasn’t there before. It’s called “defend”, and as you might guess it allows you to lower all damage for a round (including damage from magic attacks), but it also restores a little HP to your party. 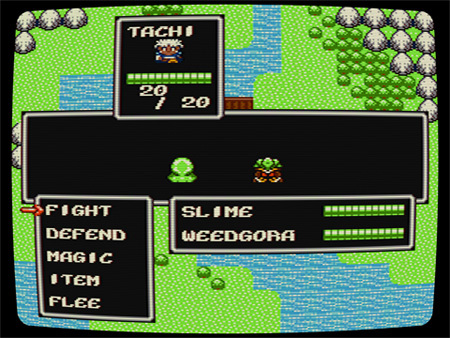 Before, you did get a little HP back at the end of each battle, but using magic and getting hit by enemies knocked off a lot of health, requiring the player to fill their inventory up with dozens of healing items which they’d need to constantly chug just to stay alive. At first it wouldn’t be so bad, but the later you go into the game the worse it would get. The new “defend” command and other mechanical tweaks are meant to combat that, meaning you’ll need to stop and heal less, and shouldn’t need to cart around so much junk just to stay alive. Likewise, battles are being completely rebalanced to keep the game’s momentum moving. Enemy encounters in Another Star are meant to be quick and should only last a few rounds. Yes, the player should have to think about what they’re doing and decide how to approach each battle, but each and every random battle shouldn’t be a full-blown chess match. (That’s what bosses are for!) Currently, the mid-to-late game encounters missed this, and it could get really long and tedious just walking across the overworld. The coming revisions will really fix this right up. I hope that all these improvements come together to create a game that you’ll really want to sink your teeth into. In the meantime, grab the beta while you still can. It won’t be up for much longer!